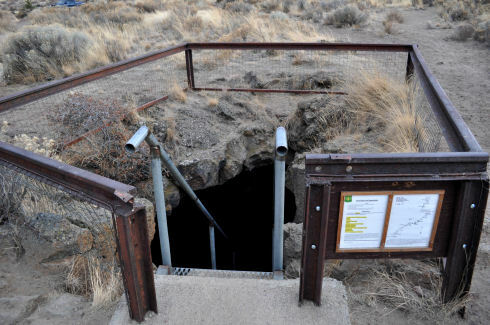 You are currently browsing the tag archive for the ‘lava tubes’ tag. 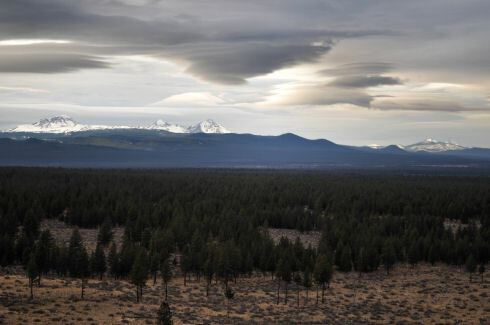 Looking west across the volcanic landscape topped with lenticular clouds. 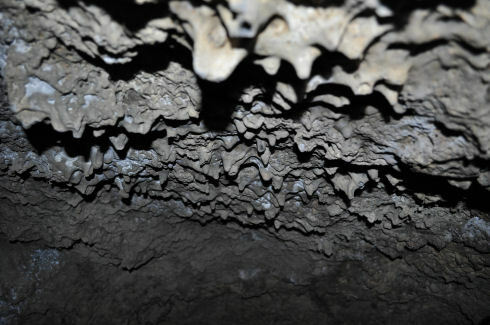 This is a continuation of my Christmas vacation blog, begun in Part I.
Monday we went to Boyd Cave, a lava tube. We took highway 97 to China Hat Road and went out into the dry valley and had a stupendous view of altocumulus lenticularis over the string of dormant volcanoes along the horizon. We took the truck up the side of one of the tiny ash cones to get a better view. At the bottom side near the road, many locals were using the granular constitution of the cone to practice shooting their various weapons into. So, though Arno and I were at the top, and on the other side of the cone, while we took photos, our soundtrack was a cacophony of shotgun and rifle blasts. Hard to stay relaxed the whole time, ha ha. But we did get some neat photos of the clouds. Prior to coming out to Boyd Cave, we had looked out across the valley at this vast landscape the day before, and saw the remnants of a lava flow. A deep river of lava poured through the valley following a volcanic eruption around 100,000 years ago. The flow lasted so long that as it flowed the outer edges and top of the river cooled and hardened. The outer crust kept the interior very hot so the remaining lava continued to flow, emptying the shell. The hot stuff inside the tube kind of oozed down the sides a little, and began to drip from the ceiling, but cooled quickly and remained in tube form till today. THAT is what we hiked inside. It's simply a hole in the ground, with a fence around it. And a ladder. 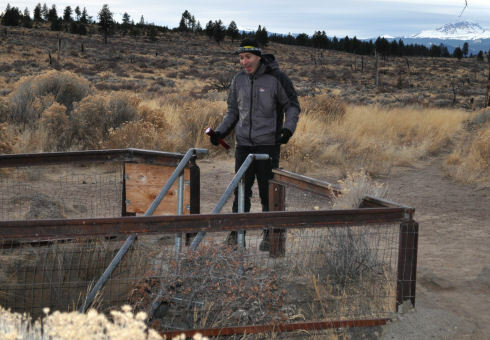 You drive out into the desert, park on the side of a dirt road, and begin walking out through the sagebrush until you come to a fence with a little U.S. Forest Service sign tacked to the fence, next to a ladder that disappears into the earth. No staff, no buildings. Just you and a hole in the ground. Moving through the inside was surprizingly easy. A portion of the roof caved in, so we had to climb over. 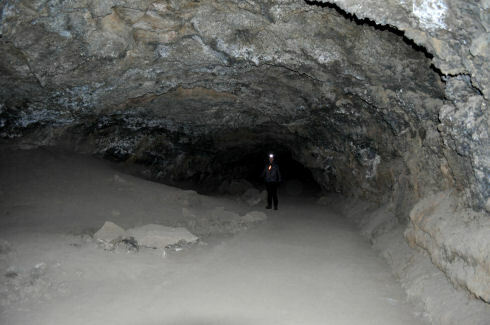 In the intervening millennia, typical erosion and dust deposits have covered the land above the lava tube, so it is not detectable, but the hollow tube remains below ground. The floor of the tube is surprisingly flat and smooth, except for spots where the ceiling caved in and we had to crawl over boulders. 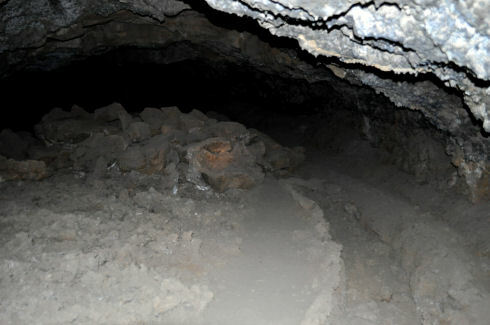 We attempted to go the length of the cave, which the U.S. Forest Service estimates at 1,880 feet long. We got close enough to see the end, maybe 1,865 feet into the tube, but the last little bit was at the end of a small hole and we had already crawled through a couple of those. Wriggling my way through one of the tight squeezes. It was pitch black inside, so we wore headlamps and carried a flashlight too. It was cold, but quiet and still inside there. We think we saw a bat, but… you know, bats are dark and hard to spot inside of midnight. 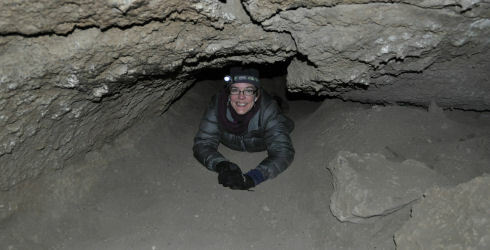 I only had one little bit of claustrophobia, crawling through the first tunnel. Two are so low I had to get on my belly and wiggle through like a sand worm. That means I belly-wiggled four times total before I got out. The first time I stopped inside while I let my heartbeat relax a little, and had the courage to go all the way through. After that, no problem at all. We got back to Lara House just in time for wine and cheese, and that’s when I met Peter and Lynda’s granddaughter and showed her photos from inside the cave. 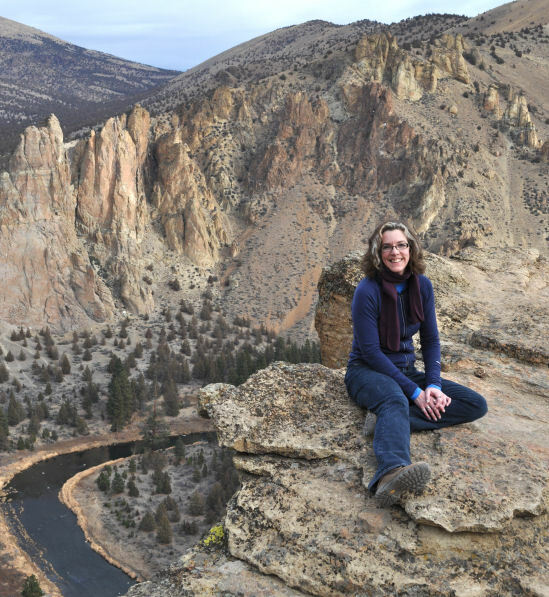 She told us about hiking at Smith Rock, and we said we would be going there the next day. Still believing ourselves to be stuffed from Christmas dinner, the Monday wine & cheese was sufficient to take the edge off, and we went out for our walk in Drake Park and then turned in for the evening. 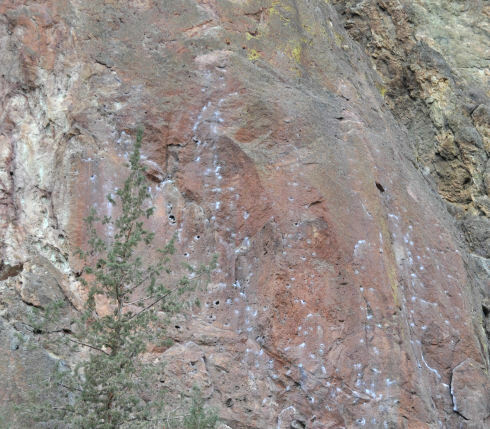 White chalk tracks up the rock face like alien footprints. Tuesday, after a final scrumptious breakfast from Peter and Lynda, and hearty goodbyes, we hit the road while it was still morning. 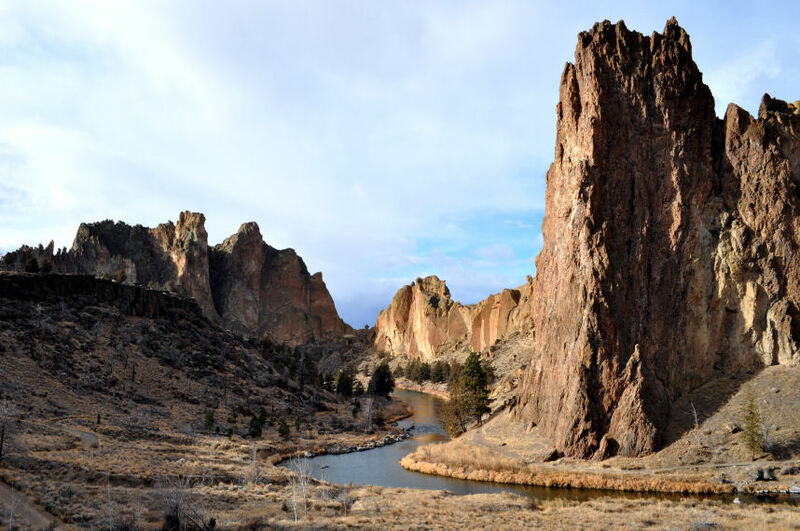 We went north along 97 to Smith Rock State Park, a striking outcropping of rock that bursts above Crooked River, the same river we saw on Saturday at Peter Skene Ogden State Scenic Viewpoint. Skies were cloudy, it was cold and windy, but there was no precipitation at all, so it was almost good weather, considering the date. Though Arno notes that Smith Rock is known as the birthplace of American sport climbing, I am not interested in rock climbing, only hiking. Luckily, there are lovely trails to hike. I did not muster the cojones to scramble over Asterisk Pass, and instead we walked along the river, around the peninsula of land. This gave us more time on the trail, and a chance for me to photograph Mallards. 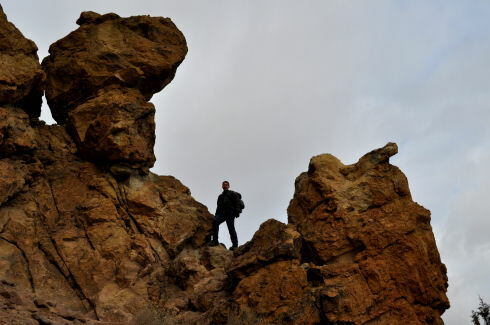 On the last leg of the hike, we spotted rock climbers, finally braving the air that had thawed enough to make a climb fun. At long last we had used up our vacation time. We arrived in Hood River in the midst of a snowstorm in the dark. I transferred my gear to the Saturn Dragon Wagon and traveled the last hour home alone through the Gorge.